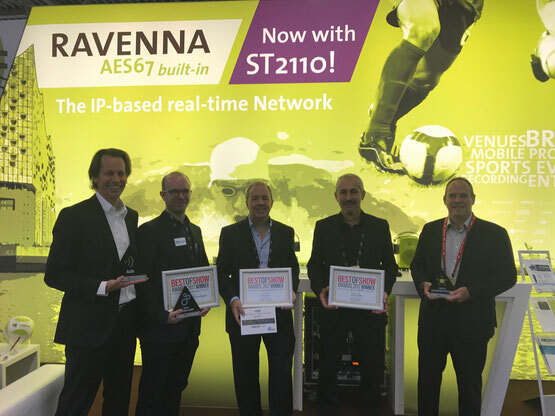 The three RAVENNA winners were Merging Technologies for their ANEMAN audio network manager in the system automation & control category; Lawo for the mc296 grand production console which scooped the audio award; and Artel, whose multi-function IP platform with integrated non-blocking layer switch won the content & communication infrastructure category. Sonifex was listed as a finalist in the audio category for their new AVN-PXH12 2 x 12 channel mixer monitor, ultimately losing out to Lawo. “There is a certain irony in being pipped at the post by another RAVENNA partner, but if it had to be anyone, Lawo is certainly a worthy opponent!” quipped Sonifex MD, Marcus Brooke. However, Sonifex were able to celebrate a win anyway as the same product received one of just three New Bay Best in Show awards from Audio Media, who also honoured Merging’s revolutionary ANEMAN audio network management tool. Other RAVENNA partner wins include the IQOYA *VIP IP radio software from Digigram; the RadioMan ACCESS cloud radio broadcasting platform from Jutel; the Manager NMS (network management system) from Worldcast Systems; and the Intraplex IPConnect IP data protection software application from GatesAir, all from Radio World magazine.